You probably already know that I have a thing for states. Like some people love monograms, I love our states. (See posts here & here for proof.) One of my favorite dingbat fonts is State Face (See my other favorites in this post!). A pretty cool feature of PicMonkey that I love to use is adding the fonts I've downloaded to my computer into my designs. 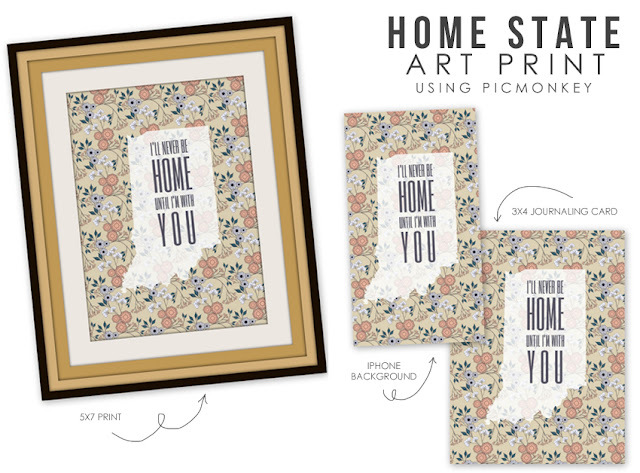 Today I want to share how to make a fun little state print using PicMonkey. You can adjust this print to make journaling cards, a post card, a background for your phone or your tablet, stickers for your planner, or just to hang on your wall when you're far from home. First I browsed ColourLovers.com to find a pattern I liked. This site is one of my favorite resources for free for personal use patterns. There are so many colors, designs, and patterns to choose from. I saved the largest resolution option and opened it in PicMonkey. I decided to make a print 5x7 so I cropped the image down to that size. 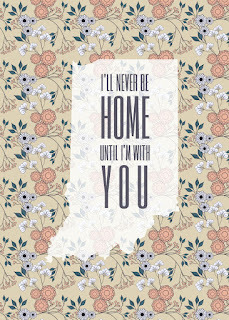 Using the font option I added the State Face font to my canvas and decided to go with our current state, Indiana. Just type out the alphabet until you find your sate shape, there is even the USA shape in the mix too. Since there aren't any grid lines in PicMonkey, I eyeballed the center of the canvas and placed the state there. I also used the fade option to change the opacity of the state I chose. Of course you could be done here but I wanted to add a nice quote about home to my print. 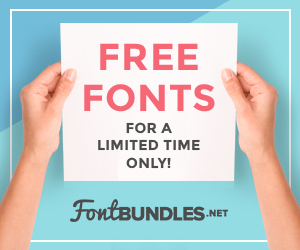 I used another font from my computer but PicMonkey has a ton of free fonts. But if you'd like to upgrade to Royale you get access to a bunch more fonts, effects, and overlays. I subscribe yearly for $33/year. There is a monthly subscription as well for $4.99/month. Not to bad for an amazing photo editor and mini design machine! If you're interested in signing up, please click here. I usually print images through Picasa. Picasa offers size options to print your images/photos so you don't have to make any sizing adjustmenst. I hope this little DIY was inspiring for you. I am going to put this as my home screen on my phone since Zach will be heading to Korea again soon. We're also almost done with the house so Home has a whole different meaning too. Even though I've been out of Virginia for nearly 4 years I still get homesick every now and then. I think it would be neat to make a whole set of prints with where we came from and where we are now. 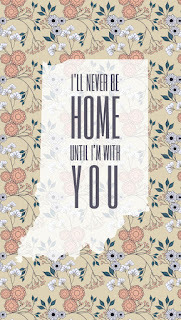 What quotes about home to you love? Do you ever get homesick? ps. 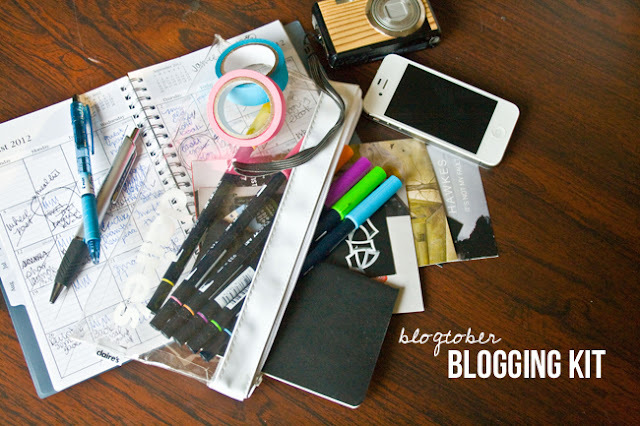 Find all my PicMonkey tutorials here and all the DIY's on the blog here. 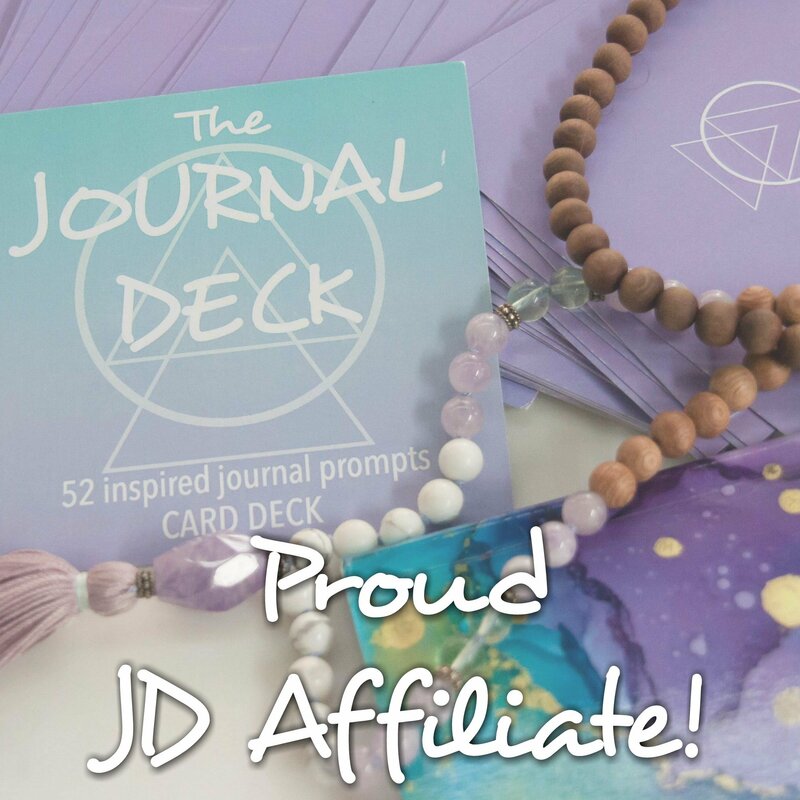 If you'd like to have the iPhone background click here, for the 5x7 print click here, for the 3x4 journaling card click here. All are .jpg images so right click and save the image to your desktop.